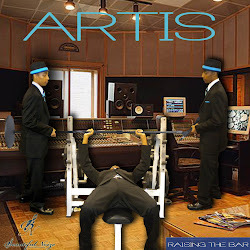 Jaquan Barnett aka "Artis" Joins Some of the M.O.C.I.T.I. Brothers in a Mentoring Session w/Students at MLK Elementary on 4/29/11 in Los Angeles, CA! I really had a great time with the M.O.C.I.T.I. 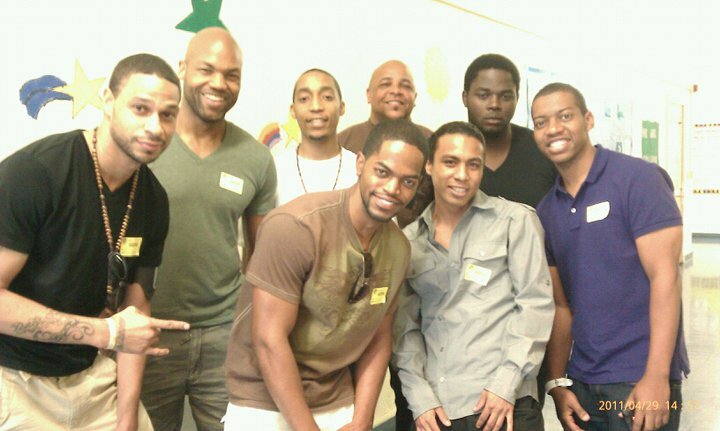 brothers on Friday, April 29th, 2011 at the Martin Luther King Jr. Elementary School in Los Angeles, CA where we had the opportunity to introduce ourselves to the students, briefly share some advices and words of wisdom about life, and most importantly speak to the "4th and 5th grade" students, encouraging them to "follow through" and make sure they execute on all of their commitments, tasks and future endeavors to the best of their abilities. In all actuality, "follow through" stood as the central theme of discussion during our mentoring session, and we stressed the importance of completion, accountability and responsibility. We explained to the students that your words as well as your actions will be critiqued, and when you give your word and commit to something; whether it be school, or any extracurricular activities such as sports, clubs, music, etc., people are depending on you to execute and give your very best efforts. So, if a person follows through and executes on a consistent basis, he or she will not only build a great reputation and rapport with others, but will also build trust, dependability and reliability within others, which are positive and well respected qualities that one should possess in life. Moreover, if one does not "follow through" and honor his or her commitment, there are consequences for his or her actions; malpractices and his or her reputation will not reflect in a positive way. Therefore, he or she will not build a great reputation and rapport with others, it will be much harder for someone to trust your word, and you can be labeled and perceived as an unreliable and irresponsible person. Depending on the circumstance, we also explained to the students that there are certain punishments and consequences that can be enforced for not following through, and for that reason, the positive effects of honoring your commitments and finishing what you start is always the best option for anyone! 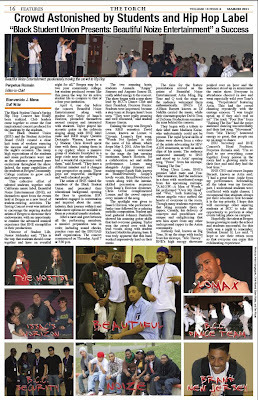 Honestly, it was a rewarding experience for me, I am thankful to M.O.C.I.T.I. for providing me with the opportunity to aid and contribute to this movement and I would like to thank and applaud all of the M.O.C.I.T.I. brothers that came to help out in the past, as well as all of the brothers that were in attendance on Friday for their positivity and philanthropy in this process. I will gladly return in the future to assist in anyway possible and will do my best to make more of an imprint in the students lives. Thank you again! 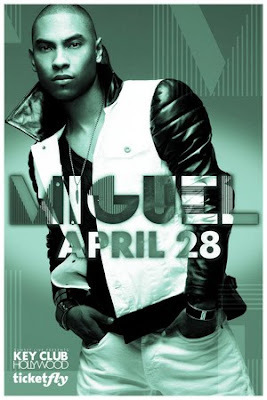 -J.B.
Miguel Live In Concert at the Famous Key Club on 4/28/11 w/Opening Act LazaJuan & performances by 'Artis & Q' was a Great all Around Night for Music! When an artist does a great job, he or she definitely deserves praise and compliments for his or her showcase, so this exclusive shout out is to R&B Sensation "Miguel" and his band for energizing, igniting and simply keeping the ladies and gentlemen entertained the entire night with his music. With no exaggeration, he is an amazing performer, artist and if given the opportunity to support and see him live in concert please take advantage of it! Everyone in the crowd had a great time and we (LazaJuan, Q, Artis, Ming and DJ NahSla) were inspired by his stage presence, singing, and showmanship! 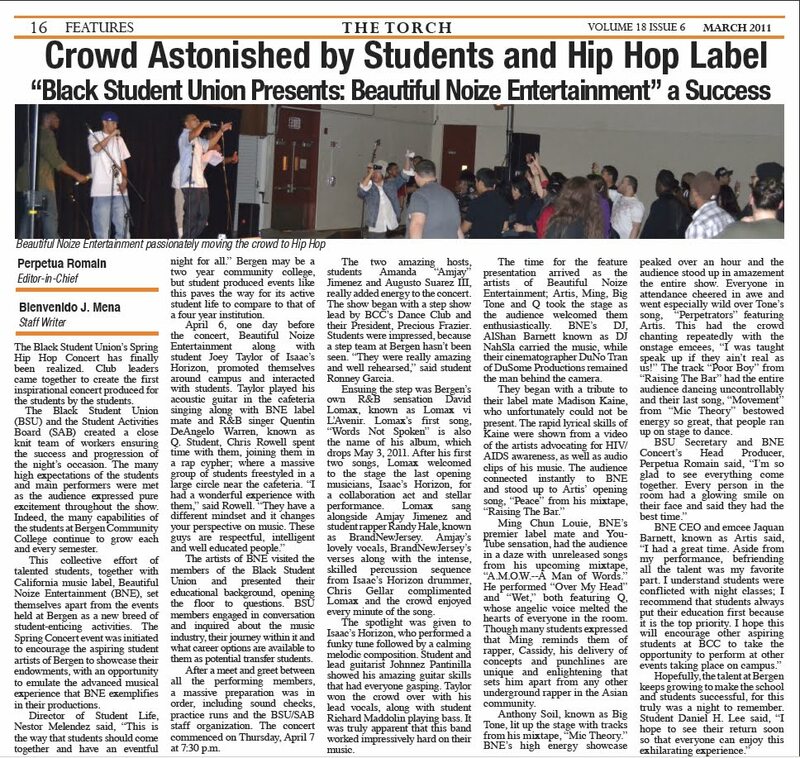 New B.N.E Article: Crowd Astonished By Students and Hip Hop Label by Perpetua Romain, Editor-In-Chief and Bienvenido J. Mena of the Torch Newspaper! The Black Student Union’s Spring Hip Hop Concert has finally been realized. Club leaders came together to create the first inspirational concert produced for the students by the students. The Black Student Union (BSU) and the Student Activities Board (SAB) created a close knit team of workers ensuring the success and progression of the night’s occasion. The many high expectations of the students and main performers were met as the audience expressed pure excitement throughout the show. Indeed, the many capabilities of the students at Bergen Community College continue to grow each and every semester. This collective effort of talented students, together with California music label, Beautiful Noize Entertainment (BNE), set themselves apart from the events held at Bergen as a new breed of student-enticing activities. The Spring Concert event was initiated to encourage the aspiring student artists of Bergen to showcase their endowments, with an opportunity to emulate the advanced musical experience that BNE exemplifies in their productions. Director of Student Life, Nestor Melendez said, “This is the way that students should come together and have an eventful night for all.” Bergen may be a two year community college, but student produced events like this paves the way for its active student life to compare to that of a four year institution. The artists of BNE visited the members of the Black Student Union and presented their educational background, opening the floor to questions. BSU members engaged in conversation and inquired about the music industry, their journey within it and what career options are available to them as potential transfer students. After a meet and greet between all the performing members, a massive preparation was in order, including sound checks, practice runs and the BSU/SAB staff organization. The concert commenced on Thursday, April 7 at 7:30 p.m. The two amazing hosts, students Amanda “Amjay” Jimenez and Augusto Suarez III, really added energy to the concert. The show began with a step show lead by BCC’s Dance Club and their President, Precious Frazier. Students were impressed, because a step team at Bergen hasn’t been seen. “They were really amazing and well rehearsed,” said student Ronney Garcia. Ensuing the step was Bergen’s own R&B sensation David Lomax, known as Lomax vi L’Avenir. 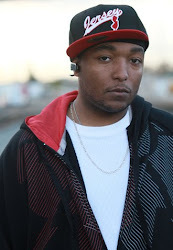 Lomax’s first song, “Words Not Spoken” is also the name of his album, which drops May 3, 2011. After his first two songs, Lomax welcomed to the stage the last opening musicians, Isaac’s Horizon, for a collaboration act and stellar performance. 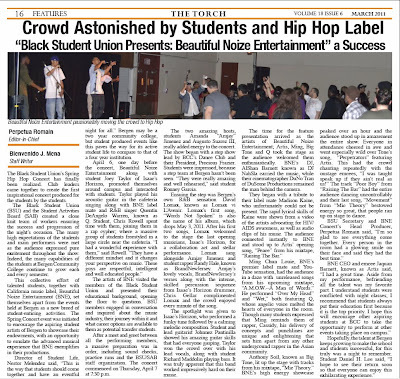 Lomax sang alongside Amjay Jimenez and student rapper Randy Hale, known as BrandNewJersey. Amjay’s lovely vocals, BrandNewJersey’s verses along with the intense, skilled percussion sequence from Isaac’s Horizon drummer, Chris Gellar complimented Lomax and the crowd enjoyed every minute of the song. The spotlight was given to Isaac’s Horizon, who performed a funky tune followed by a calming melodic composition. Student and lead guitarist Johnnez Pantinilla showed his amazing guitar skills that had everyone gasping. Taylor won the crowd over with his lead vocals, along with student Richard Maddolin playing bass. It was truly apparent that this band worked impressively hard on their music. The time for the feature presentation arrived as the artists of Beautiful Noize Entertainment; Artis, Ming, Big Tone and Q took the stage as the audience welcomed them enthusiastically. BNE’s DJ, AlShan Barnett known as DJ NahSla carried the music, while their cinematographer DuNo Tran of DuSome Productions remained the man behind the camera. Ming Chun Louie, BNE’s premier label mate and You-Tube sensation, had the audience in a daze with unreleased songs from his upcoming mixtape, “A.M.O.W. –A Man of Words.” He performed “Over My Head” and “Wet,” both featuring Q, whose angelic voice melted the hearts of everyone in the room. 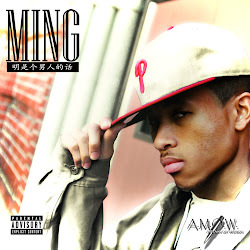 Though many students expressed that Ming reminds them of rapper, Cassidy, his delivery of concepts and punchlines are unique and enlightening that sets him apart from any other underground rapper in the Asian community. Anthony Soil, known as Big Tone, lit up the stage with tracks from his mixtape, “Mic Theory.” BNE’s high energy showcase peaked over an hour and the audience stood up in amazement the entire show. Everyone in attendance cheered in awe and went especially wild over Tone’s song, “Perpetrators” featuring Artis. This had the crowd chanting repeatedly with the onstage emcees, “I was taught speak up if they ain’t real as us!” The track “Poor Boy” from “Raising The Bar” had the entire audience dancing uncontrollably and their last song, “Movement” from “Mic Theory” bestowed energy so great, that people ran up on stage to dance. Spend an evening enjoying the music of local homegrown musicians and performers. 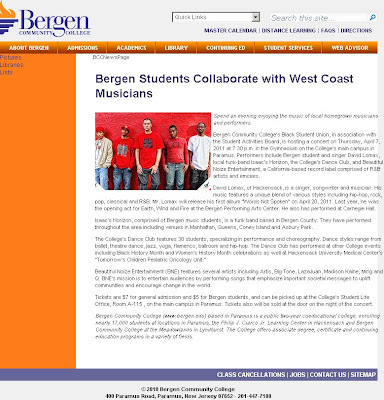 Bergen Community College’s Black Student Union, in association with the Student Activities Board, is hosting a concert on Thursday, April 7, 2011 at 7:30 p.m. in the Gymnasium on the College’s main campus in Paramus. Performers include Bergen student and singer David Lomax, local funk-band Isaac’s Horizon, the College’s Dance Club, and Beautiful Noize Entertainment, a California-based record label comprised of R&B artists and emcees. David Lomax, of Hackensack, is a singer, songwriter and musician. His music features a unique blend of various styles including hip-hop, rock, pop, classical and R&B. Mr. Lomax will release his first album “Words Not Spoken” on April 20, 2011. Last year, he was the opening act for Earth, Wind and Fire at the Bergen Performing Arts Center. He also has performed at Carnegie Hall. Isaac’s Horizon, comprised of Bergen music students, is a funk band based in Bergen County. They have performed throughout the area including venues in Manhattan, Queens, Coney Island and Asbury Park. 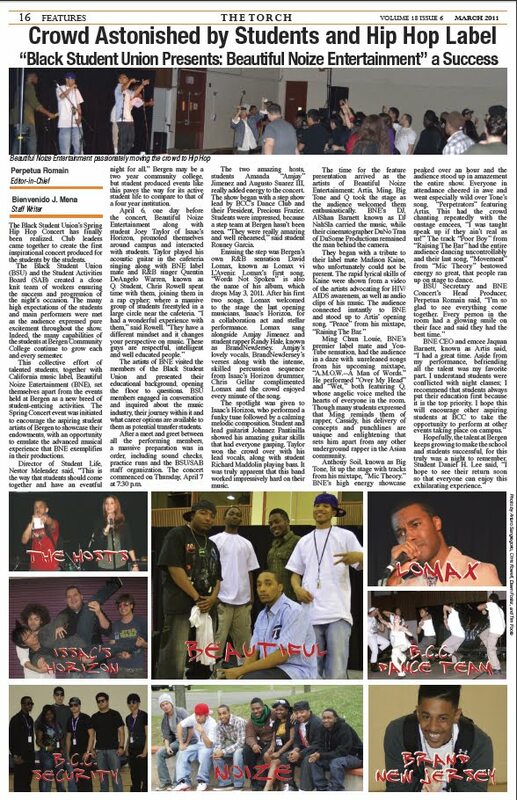 Beautiful Noize Entertainment (BNE) features several artists including Artis, Big Tone, LazaJuan, Madison Kaine, Ming and Q. BNE’s mission is to entertain audiences by performing songs that emphasize important societal messages to uplift communities and encourage change in the world. Tickets are $7 for general admission and $5 for Bergen students, and can be picked up at the College’s Student Life Office, Room A-115 , on the main campus in Paramus. Tickets also will be sold at the door on the night of the concert. 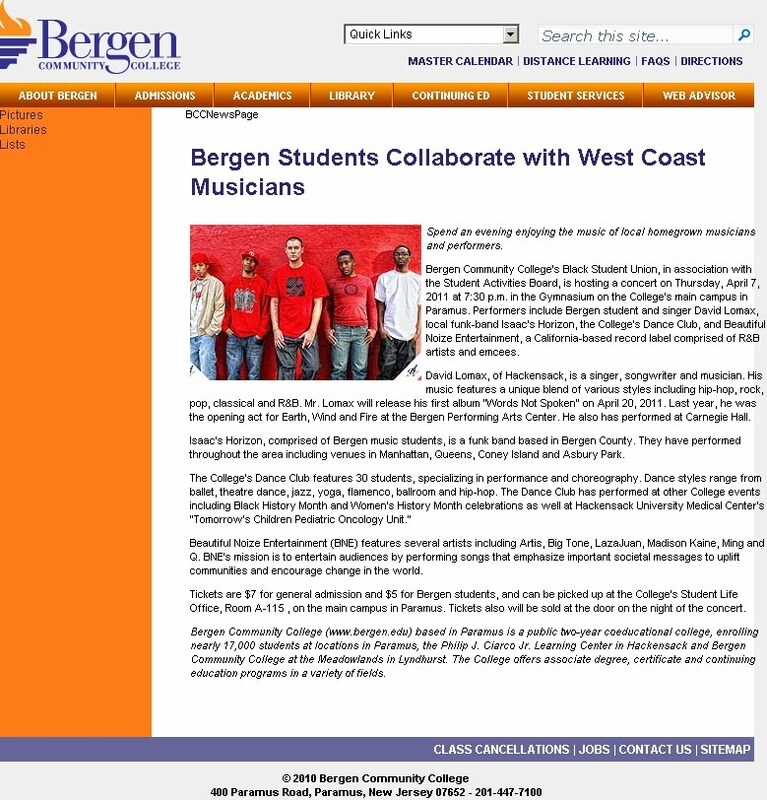 Bergen Community College (www.bergen.edu) based in Paramus is a public two-year coeducational college, enrolling nearly 17,000 students at locations in Paramus, the Philip J. Ciarco Jr. Learning Center in Hackensack and Bergen Community College at the Meadowlands in Lyndhurst. The College offers associate degree, certificate and continuing education programs in a variety of fields. The show was great, we had a blast from the day we landed; to the promo at BCC on Wednesday April 6th, 2011, the performance night on April 7th, 2011 to the next evening we left back to CA on April 8th, 2011! Shout outs to the entire Black Student Union (BSU) for welcoming, promoting and featuring us as the feature presentation of the BSU Concert, the Student Activities Board (SAB) for their involvement, aid and hospitality, all the opening act performers, Isaac's Horizon, David Lomax, BrandNewJersey, the BCC Dance Club we loved your performances, you all are talented and we will continue to stay in contact most definitely, was great meeting you. Shout outs to the amazing hosts Amjay Jimenez and Agusto Suarez, your energy, delivery and performance was great! Thank you for a great introduction and ending, you did your thing. Special Shout outs to our Director of Publicity Perpetua Romain, this would not have happened without you! We are deeply appreciative and we all thank you for setting this up so we can display our talent. We hope we made you proud and met your expectations. #PR and #PR literally!